I guess it started a long time ago when I saw this image in a book somewhere but I always wanted it. Even though I do not consider myself as a member of any organized religion, I still find the teachings and life of Christ to be the greatest guides to living your life. He represents a strength that we all have or could have in just how we interact with each other and in living our lives. He has had a lasting effect on my view of life. This tattoo was done during a great deal of change in my life including my apprenticeship and begining to pierce professionally. To a degree it reflects the strength that I was feeling at the time. 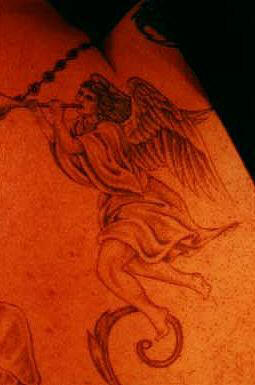 This is of course a very traditional tattoo that dates back to the 1800s. 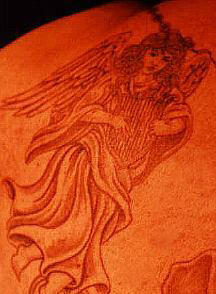 Based on the song "Rock of Ages" it was an image often found in Victorian homes. 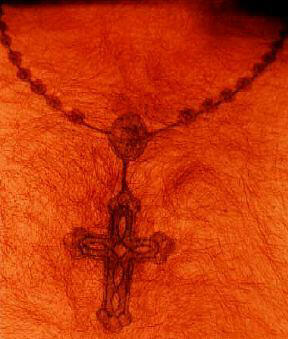 It is considered to be a Sailor tattoo as often sailors would get religious symbols on their back to avoid flogging. The Tattoo was done late 1993 and early 1994 by Sherry Sears at Creative Images/4817 University Ave #7/Des Moines, IA 50310/515-277-8288. It was done in 6 sessions lasting between 3-4 hours. The main body was outlined in a 3 needle which was kind of a challenge for Sherry because she works mainly with single needle outlines. We started this piece right after we finished the back piece. 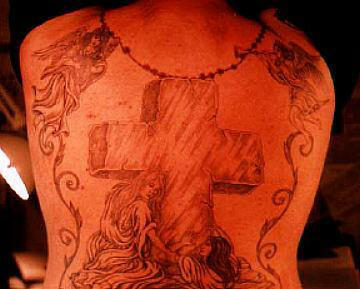 It kind of tends to be along the same line as the back piece. I liked the idea that I would always be wearing one even though I'm not Catholic. This took three 2-3 hour sessions and let me tell ya the red fill work was not fun. It was done of course by Sherry.